Most people who experience strong tinnitus symptoms have tried many things, all in an effort to find relief. Their doctor may have told them to live with it, as there is no cure. While there is no known cure, there are ways to manage tinnitus that allow sufferers to engage in normal day-to-day activities, including finding peace during quiet moments. Here at Hearing Associates of Las Vegas, we have developed a one-of-a-kind tinnitus relief studio to help people find respite from their persistent tinnitus. In our Summerlin office, we have created a soothing and therapeutic room that we have dubbed the Tinnitus Relief Studio. Tinnitus is often exacerbated by anxiety and stressful situations, so we designed a space to provide the most peaceful environment possible. Gone are harsh lights and uncomfortable exam room furniture. Instead, we have chosen soothing decor, and you can use our zero gravity massage chair to allow your stress to melt away. As you relax, our hearing instrument specialists will work with you to develop an individualized tinnitus treatment plan. When it comes to treating your tinnitus, there are a few ways in which our tinnitus relief studio is used. Sound therapy testing – A proven way to treat tinnitus is to use sound therapy. There are a variety of sound therapy-based treatments, from sound generators like the Levo System to hearing aids with tinnitus management built into them. In our spa-like tinnitus relief studio, you can focus on the treatment that works best for your tinnitus. Tinnitus counseling – Dealing with tinnitus on a constant basis can trigger stress, depression, frustration, and other negative feelings. Our tinnitus counseling will focus on ways you can manage these feelings and better understand your tinnitus triggers. Hearing rehabilitation – Some forms of tinnitus are severe enough to drown out most other sounds, leaving you struggling to hear anything beyond the constant sound. With our hearing specialists’ help, you will learn how to retrain your hearing. 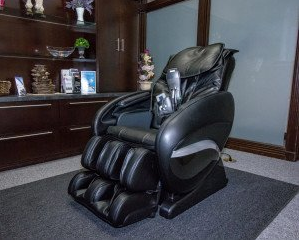 Short getaways – Our tinnitus relief studio is available for 30-minute sessions, and the zero gravity chair can help take the stress off your body and increase blood flow. That way, you can enjoy a short, re-energizing getaway in our peaceful oasis. A combination of these tinnitus management tools is the best way to keep your tinnitus under control. We believe everyone deserves to receive relief from tinnitus. That is why your first session in the tinnitus relief studio is completely free. If you or your loved one is ready to take control of their tinnitus, contact us for a consultation with one of our tinnitus experts.